I feel like my feet just aren't really touching the ground at the moment, I just cannot seem to catch my breath somehow. The weeks are taking on a warp-speed feel, and here I am, stuttering around in a dither, wondering how on earth it can already be three weeks since Yarndale. Three weeks? How is that even possible, surely it was just the other day?? But I am not complaining, I am very happy as I scoot about my days and I have so much to be grateful for. At the end of last week, I took myself rather spectacularly out of my comfort zone and and hopped on a train, journeying all the way down to London. It's been a couple of years since I was last there and it felt rather odd for me to be out and about in the Big City. I feel so at home in my little rural market town surrounded by green hills and trees, and am less inclined to venture out of it than I ever used to be. But I believe it's good to do these things every so often, plus I was rather excited by the prospect of a night away staying in a hotel. How very Grown Up and Adultish!! 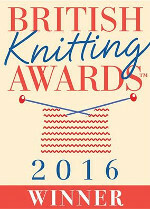 The occasion was the annual British Knitting Awards, held at the Knitting and Stitching show at Alexandra Palace. The results were announced in the week before Yarndale, and I honestly nearly fell off my studio chair (which does have very wobbly legs it has to be said). Some of you may know that I was in the top five nominations for two of the crochet categories, and some of you may even have voted for me back in the Summer - thank you so very much if you did! I am really chuffed indeed to tell you that I won first place in both categories - Favourite Crochet Blog and Favourite Crochet Designer. I still can't quite believe it, but I have my lovely framed certificates and rather a warm happy glow to remind me it is indeed true. The award ceremony in London was well attended and fun - a champagne reception and lots of lovely friendly happy yarny peeps to hang out with. I am especially thrilled to tell you that as well as my own two awards, Yarndale also won first place in the Best Knitting Event category which is a huge honor for our quirky little homespun show held in the sheep pens! We are honestly very, very chuffed indeed, and it was wonderful for me to be at the award ceremony with two of my fellow Yarndale organisers. All the results are listed in the current issue of Lets Knit magazine, as well as online here. It's a real tribute to the talent and passion that exists in the yarn industry as well as the tremendous support which is so great amongst the yarn loving public. Thanks ever so much to everyone of the 14,000 people who took the time to vote. It's hard for me to put into words my heart felt thanks for your support and friendship, not just with these awards but with everything I share here in the Attic. It honestly does mean a huge amount to me, and I couldn't be more grateful. Lets keep spreading colour and creativity, finding happiness in the little things and hooking up colourful blankets together, it's a happy way to be! Parabéns cara Lucy, sou brasileira e admiro muito seu trabalho ele é perfeito e muito criativo. Congratulations Lucy! You most definitely deserve these awards. But you are truly deserving of these awards! Your blog inspired me to learn to crochet and I know that I'm not the only one. For me, crochet always conjured up images of the psychedelic 60's and 70's brown and mismatched granny square blankets and waistcoats but you have given crochet a new, exciting colourful lease of life. You give so much pleasure and inspiration, I'm so pleased that you have been given recognition for this. Congrats from Ohio! USA. I spend my evening under the covers while reading your blog. It takes me across the ocean to your wonderful little village. into crochet one wet Sunday afternoon in October 2009. How wonderful Lucy! Congratulations on the award and wishing you more inspiration as always! You are so deserving of these awards. You share your lovely personality, your universally squee-able sense of colour and your technical know-how in a humble, but professional manner. You are an inspiration to thousands (I'm sure - if not a million or so) and you do it all out of your generous heart. Thank you and may many more awards come to you. A very well deserved win. THANK YOU for all that you share. You do inspire me. Congratulations and very well done. You deserve the recognition. CONGRATULATIONS, Lucy. On blog catch up due to internet problems and just saw this post. Well done and I'm sorry that I missed meeting you at Yarndale, but you'd just popped out for a break & we needed to head for The Lakes District as that was where we were headed for the weekend. I enjoyed. Take care. Hooray, well done! Special recognition for a very special blog! I'm SO happy for you Lucy!!! I just love your work!!! A well deserved honour, Lucy. Thanks for all the colour-joy you spread. Congratulations from South Dakota, USA! You richly deserve these honors. Thanks for sharing with us. Big Congrats!! Thank you for blogging. This is one of the best places to visit in me reading list. So happy for you. congratulations Lucy. I have loved reading your crochet blog for years and know you truly deserve all the awards received. Congratulations, Lucy!! I love your blog and think you so deserve these awards. Happy for your Yarndale team as well on that award. You are such an inspiration. Congratulations, you so deserve this honour. Your generous nature is totally amazing as is your colour therapy. Well done Lucy.You are known all over the world, no mean fete.Big hugs from Shirley N.Z. Many congratulations, it is so well deserved for you personally and the Yarndale team. Thank you for reintroducing me to the joy of crochet again and introducing me to the wonderful Winwick Mum (Christine) and sock knitting. Love all your photos Yorkshire too, bringing memories of my childhood. Congratulations from Poland! You truly deserve the prizes! I love reading your posts as they are full of color and energy. I am thinking of crocheting something myself as you make it seem so simple.